At first thought, it seems illogical to leave Yaroslavl for the village of Vyatskoye. After all, Yaroslavl is a UNESCO world heritage site boasting monasteries and house-museums. Vyatskoye is just a village. But what a village it is. 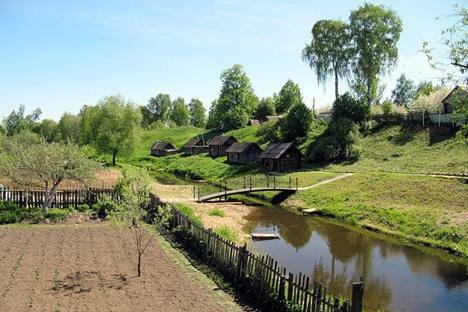 The whole settlement is a museum complex devoted to 18th and 19th century rural Russian life. The village of Vyatskoye is first mentioned in official records in 1502. In the 18th century, not one but two Russian Orthodox churches were constructed in the village. The Church of the Resurrection was built with money donated by local peasants in 1750, and the Church of the Assumption was erected 30 years later by a local merchant. Today both churches feature icons dating back to the second half of the 18th century and first third of the 19th century. The village might have remained one of many neglected towns in the Russian countryside except for the efforts of businessman Oleg Zharov and his wife Larissa. In 2006, they were looking for a house in a quiet place within a short drive of Yaroslavl. When they saw an ad for a mid-19th century house in Vyatskoye, they knew they had found what they wanted, even though it required massive renovation. After the repairs on their home were complete, they began to look more closely at their new hometown. “Zharov, an entrepreneur, wanted a quiet and tranquil place, but soon realized that it wouldn’t be fair to keep this quiet nook all to himself,” said Andrei Konovalov, the manager of the complex. The central museum of Vyatskoye, the Museum of Russian Enterprise, opened in 2008 in the house of a merchant named Galochkin. It shows the life of a village that wanted to become a city. Visitors are greeted at the entrance by a sculpture of “A Nimble-Handed Yaroslavl Peasant,” an epithet Nikolai Gogol used in his novel “Dead Souls.” In the 19thcentury, there was a popular expression: “Yaroslavl men are all handsome. Their curly blond hair is worth a hundred rubles. Their wild little heads are worth a thousand rubles, and he himself is priceless.” This reputation were linked to the fact that many Yaroslavl peasants spent two-thirds of the year doing seasonal jobs in St. Petersburg and Moscow, because there was not enough land in their native region for farming. They eked out a living by working in the cities as roofers, stove builders and plasterers. The museum’s exhibits include evidence of this prosperity, including antique clocks, uncommon household goods (for example, an early 20th century washing machine with a case made of oak), music boxes, gramophones, an Edison phonograph, spinning wheels, Singer sewing machines and ornate stovepipes. Most of these objects were donated by villagers. The museum staff allows visitors to crank up the music box and play the reed organ. One showcase devoted to a local photographer features a late 19th century camera and photographs of the town and its inhabitants. The newest museum in the compound is the Museum of Angels, which opened in summer 2011. It commemorates local hero Pyotr Telushkin, a Vyatskoye peasant who worked as a roofer in St. Petersburg. In 1830, he volunteered to fix the damaged wing of the angel that sits atop the spire of the Sts. Peter and Paul Cathedral without the use of scaffolding. It took six weeks of painstaking and risky work to restore the weather vane. The whole capital was abuzz with the story of the peasant’s feat and the man was awarded an audience with the emperor in addition to other prizes. The exhibits in the museum dedicated to him are geared towards children. In the museum, they can learn about angels, watch a cartoon about them, try on angel wings and admire various angel figurines from private collections. Other museums in the complex teach visitors about the life of a Vyatskoye merchant, see how pickles were stored for sale, taste the local liqueur and cucumbers and join museum employee Yasha, an actor, as he sells wares at a trading stall. In addition to the five museums, Vyatskoye has three hotels with accommodation for 120 people. The hotels also feature local antiques in their clean, modern rooms decorated with period wallpaper and historical sketches. The town also has a sauna and a pool filled with water from the natural Yerekhtansky spring. The pool is especially popular on the eve of the Theophany – in 2011 alone, 5,000 people visited it on that day. The Zharov’s expect the Vyatskoye historical and cultural complex to earn back its investment within seven years, and they hope the village’s reputation as a tourist destination will grow. What is being done in Vyatskoye is only part philanthropy. In addition to running the museums and the hotel, Oleg Zharov’s company buys the country houses of local merchants, most of which are in a serious state of disrepair. The company restores them and equips them with modern infrastructure before reselling them to owners who must promise not to change the exterior of properties considered historical monuments.